"In August 2018 I did the Athens-Santorini tour, but unfortunately I was disappointed...."
"Trip was good but boat was at full capacity with 8 people, so all sitting in cockpit..."
"I did the 'Best of Greece Tour' with Travel Talk and loved it! Our tour guide Alex..."
"I had an amazing time in this contiki island hopper. And this was all because of..."
"Firstly, as a Vegan. Nothing much to eat a few mornings. 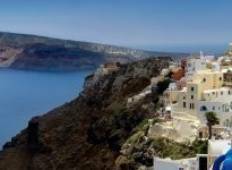 The worst one is in Fira..."